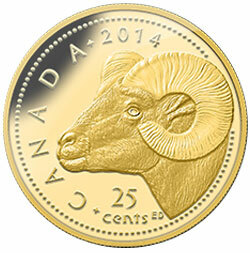 The Royal Canadian Mint expands on its best-selling series of 11-millimetre gold coins with the recent release of the 2014 Rocky Mountain Bighorn Sheep 0.5 g Pure Gold Coin. As indicated by the name, the coin is composed of 0.5 grams of 99.99% pure gold. Shown on the reverse of the strike is the image of a Rocky Mountain Bighorn Sheep. "Your coin was designed by Emily Damstra, rendered in exceptional detail despite the coin’s miniscule size, and features a profile view of the statuesque curly-horned head of an adult Rocky Mountain Bighorn ram," describes the Royal Canadian Mint website on the coin's product page. "Exquisite detailing highlights the annulus ridges of the regal ruminant’s blunt-ended left horn, which curls to within centimetres of its far-seeing eyes. The animal’s dark, short hair and light-coloured muzzle are brought to life through fine detail and engraving." Also shown on the reverse of the coin are the inscriptions of CANADA, 2014 and the legal tender face value of 25 CENTS. The artist's initials can be found near the bottom of the design. The obverse of the strike contains Susanna Blunt's effigy of Queen Elizabeth II. Obverse inscriptions include ELIZABETH II and D G REGINA. Mintage of the newest release has been capped at 10,000. Each is encapsulated and presented in a Royal Canadian Mint-branded maroon clamshell case. Current pricing of the strike is listed as CAD $79.95. However, pricing is subject to change based on market fluctuations.